It was written very quickly in august 2007, and then slowly revised and retouched (as I do with most of my works), even after the premiere recording of September 2009. However, what you have in this CD is what I consider the definitive version . The first movement, carries the sonata form to its extreme by converting the first and second subjects in two completely different sections. The first, a fugue with a short theme presented by the cello, builds into a climax. The second, a slower and very lyrical “quasi recitative”section, has long melodic lines in each of the four instruments, with simple chordal accompaniament from the other three. The developement is done exclusively on the fugue subject and the re-capitulation begins with the slow second subject, though a long and whirling coda return to a variation of the fugue theme. The second movement is a simple, song-like, thoughtful and relaxed mood piece. The third, a dance like scherzo with two trios, and the fourth, after a short slow introduction, a happy and extrovert finale, full of what I hope would be playful tunes. Although written in the atonal language, the work is set up around a “C” chord, that begins and ends every movement, except the third, that by ending with a reprise of the second trio instead of the main scherzo, ends up in a “G” which becomes the dominant of the last movements “C” beginning. This does not mean that the piece is in the tonality of C, but it gives a certain unity which for the listener is an element of togetherness. I have lately worked with those “tonal centers” technique that convey a larger tonal world ( sort of “pan tonality”) in which rapid cadences of major minor chords emerge like flashes within the more complex sounds of other, more clashing harmonies. 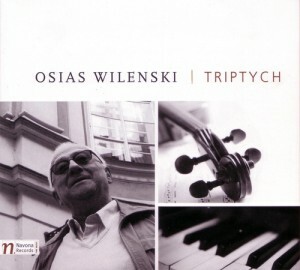 TRIPTICO (Tryptic) for piano solo. I wrote this piece in 1989. It consist of three very long and difficult sections. They follow each other without a stop building a complex structure from the first to the last bar, that grows and dies like life itself. The first (Ostinato) is based upon a sinister ground of an augmented fourth over which emerging forms begin to grow, and relate like fighting for survival. It grows into a dramatic section that then leads into the second section, a four part fugue. Its theme is characterised by great leaps, and slowly builds up into a tremendous climax. The third part (Choral) presents a choral of my invention with variations and transformation leading to another thundering climax. The end of the piece returns to the ostinato of the beginning, and dies away until it disappears. I think this work projects a marvellously depressing philosophy!! Written in 1986 and revised in 2009. Diversions consists of four short pieces in contrasting moods. The first quotes a chorale that dates back to Luther himself, dividing it amongst the three trombones in shorter and shorter phrases until they become just a few notes. The second is a bravura fanfare that, for a moment, imitates Chopin’s military polonaise. The third (and for me the most original) movement, is called Secret because of the muted effect of gradually sliding intervals that resemble a whisper. The last movement is a finale with an introduction, a rythmic section in which the three trombones play in unison, and a coda.